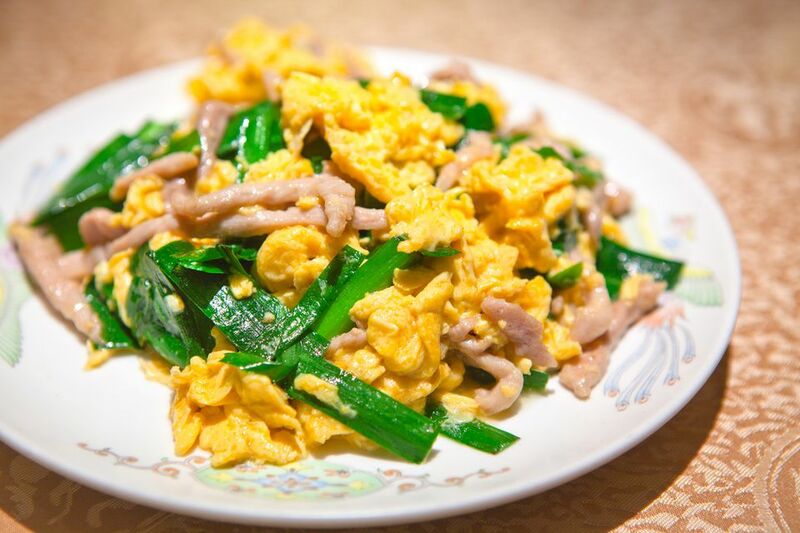 This recipe for Chinese scrambled eggs is made with Chinese garlic chives. These go very nicely with egg, but you can use regular chives as well. This dish typically calls for a lot of chives, feel free to reduce the amount to 2 or 3 tablespoons and add other seasonings if desired. Serves 2 to 4. Wash and drain the garlic chives. Remove the hard ends and any wilted green leaves at the top and chop into 1-inch lengths until you have 1/3 cup (5 tablespoons). Beat the eggs. Add the soy sauce or salt, 1 teaspoon vegetable oil and pepper. Add the remaining oil, lifting the frying pan so that the oil covers the bottom of the pan. When the oil is hot, add the chives. Stir-fry briefly, then add the beaten egg mixture. Reduce the heat to medium and gently scramble the eggs. Remove them from the heat when they are just done but still moist.